Who doesn’t want to be a stronger and faster runner? But it’s not just running that can take you there. If you harbor ambitions of running a marathon this year, then getting started on the strength and conditioning workouts is essential. As summer recedes, this is a great time to get started with long runs once a week. For your first long run, it’s important to do strengthening exercises in the gym or at home. Here are a few interesting exercises you can add to your workout routine to get the ability necessary to run faster when you are tired. And as a bonus there’s one running routine that will build explosive power in your muscles. Learn how to use interval runs to build pace and power. You will need dumbbells for this exercise. Firstly stand straight hold the dumbbells in your hand, bend down while keeping your knees straight and while you’re doing this, move your right leg behind you in such a way that it is in the air and nearly parallel to the ground. Bring it back down and straighten your body to come back to the starting position. Continue the same with other leg. Do 8-10 reps on each leg and try to get as parallel to the ground as possible, for 3 sets. Let gravity and the extra weight in your hands do their work and don’t strain your back needlessly. Standing tall and holding weights in each hand, bring your left knee up to your chest. You will feel a stretch under your thigh and into your all-important glute muscles. Release and, with control, place that same leg backwards diagonally, behind your stationary knee. Keep your shoulders and hips square so you feel a good stretch in your hips. Now stand tall and use your stationary foot to help push back up to standing. Repeat 10 per side for 3 sets. Thanks to its plyometric nature, this exercise not only helps build a stronger core, but adds explosive power to your muscle. Stand with your feet wide and arms outstretched, as if forming an X. Inhale and let your belly rise and pelvic floor soften. Lift the pelvic floor to exhale. As you are exhaling, jump and bring your feet together and lower your arms, which is the down action of a jumping jack. This exercise helps you build stability, improves flexibility of the arms and legs. Do 5-10 reps at various speeds. Use this as cool down exercise or simply with weights to build more strength. Begin by standing straight with proper upper-body posture. Take a big step forward with your right foot, lowering your body in a downward lunge. Ensure the front knee is in line with your extended foot and not jutting ahead of the toe-line. Now contract your glutes to come back to an erect position without upsetting your upper body balance. Alternate your feet as you keep moving forward, till you’ve completed 8 – 10 reps on each leg. Use weights to add greater difficulty to your stability. Make this a constant part of your training plans among all the variations and you will be a powerful runner ready to kick it to a high gear anytime! Tempo runs not just enhance your running pace and performance, but help build up endurance as it is not easy to run at sustained, controlled pace. Start your run with a 5-minute brisk walk to get warmed up. Your first interval will be a 2 minute run at a gentle pace like a jog, followed by running for 4 minutes at a medium to high intensity. 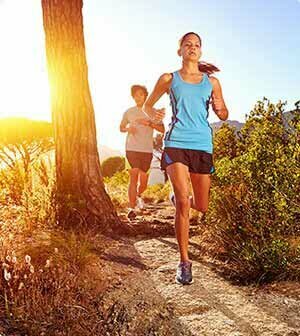 Repeat the sequence once more, starting with the easy jogging page and then doing the high-intensity tempo run, before finishing with a cooldown walk and those essential stretches. Remember it’s important to understand what exactly is tempo pace for your needs. More experienced runners could add up to 40 seconds to their 5K time, or up to 30 seconds to their 10K best to understand what pace to run at. So it’s comfortably slower than race pace. For newer runners, the idea is to push yourself up to 80% of your total intensity. To understand this, your heart should be beating at around 85-90% of your maximum heart rate. A wearable heart rate monitor would be able to display this information easily. Increase or reduce the tempo run pace on this basis.